Currently available only as a board book. Playful ceramics enact a traditional Mexican festival parade, from uno to diez. “íAquí viene el desfile! / íCuenta conmigo!” With this buoyant invitation, readers are ushered into the traditional Oaxacan festival of Guelaguetza … there’s no denying the effervescence of the event. The Aguilar sisters’ work appears in museums all over the world, and this book marks their first collaboration. [T]his peek into Mexico’s art and traditions is certainly one of the most joyous [children will] encounter. [A] fine bilingual counting book … beautiful, creative, and sometimes whimsical. [A]n irresistible bilingual picture book for those still learning their numbers. Set in Oaxaca at its annual Guelaguetza parade, the book counts the festival-goers — a crowd of hilarious clay figures by Mexican folk art masters. It's darling. Weill returns with another joyous celebration of Mexican folk art, piggybacked here on a counting book theme. [A] fine pick for those trying to teach multilingual learners counting and language. 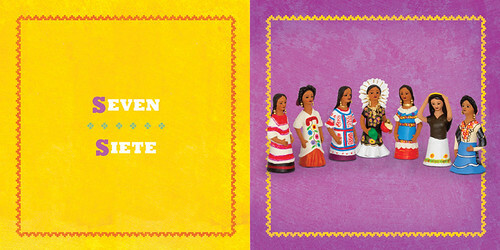 Told in English and Spanish, this beautiful counting book celebrates the Mexican July festival, Guelaguetza. Unlike the others in Cynthia Weill's series, Count Me In! A Parade of Mexican Folk Art Numbers in English and Spanish features all humans, decked out to participate in a festival called “Guelaguetza,” which is Zapotec for “to share.” Except for the initial two-page spread, which shows a line of people beginning the parade (Here comes the parade! / ¡Aquí viene el desfile! ), all of the other illustrations (along with captions that will entice the youngest of listeners) land on the right-hand pages on solid backgrounds with only the numbers 1-10 in English and Spanish. Opposite “four / cuatro,” for instance, is this: The giants are my favorite! See the person wearing the costume peeking through from inside? / ¡A mí me encantan los gigantes! ¿Ves a la persona que lleva el disfraz mirándonos desde adentro?